In this video we will discuss, how to use output parameters with dynamic sql. Let us understand this with an example. We will use the following Employees table in this demo. We want to write a dynamic sql statement that returns total number of male of female employees. If the gender value is specified as "Male", then the query should return total male employees. Along the same lines, if the the value for gender is "Female", then we should get total number of female employees. The following dynamic sql, will give us what we want. In this case, the query returns total number of "Male" employees. If you want the total number of female employees, simply set @gender='Female'. At the moment we are not using output parameters. 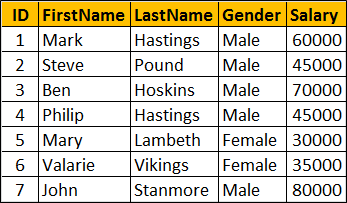 If you want the count of employees to be returned using an OUTPUT parameter, then we have to do a slight modification to the query as shown below. The key here is to use the OUTPUT keyword in your dynamic sql. This is very similar to using OUTPUT parameters with a stored procedure.